This picture was done on a whim, just for fun one summer’s evening on the roof of our home in Orvieto. I had met the two friends just that morning. German students from Weimar, they were travelling round Italy on a camping holiday. Lyz and Julie stepped out of their old 90s car and into my gallery, youthful, travelling hopefully, wise but not worldly. 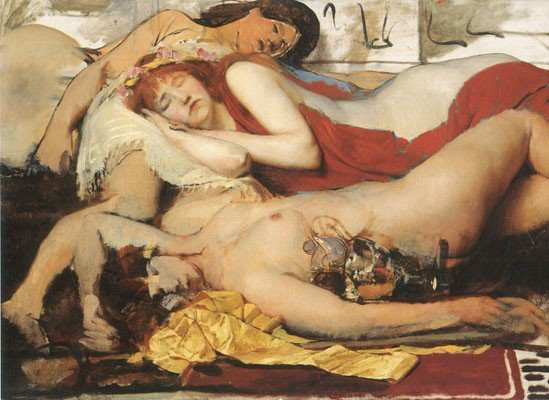 I showed them an Alma Tadema sketch in oils, Exhausted Maenads after the Dance and we used that as our inspiration. It is a song of summer, a good to be alive sort of picture. The two travellers reminded me of when I first started my travels, exploring Europe in the early seventies. My best pal and I set out on summer vacations in battered old cars from the 50s: a Riley, a Morris, a Wolseley, long defunct British marques – my present Land Rover is old and battered, so not much has changed there! We never travelled without a complete tool kit and breakdowns were frequent. I was just 18 when I set out on my first journey round the Balkans, an adult but with only childhood memories, almost entirely ignorant of the world. In middle age things tend toward the familiar, we collect possessions, we have tried and tested friends, we become creatures of habit, cultivate a career, raise a family and perhaps loose that wide-eyed sense of excitement; in fact, if anything at all is unexpected it is rarely pleasant. Thankfully, my life in my fifties is still full of exhilaration, my career is a constant journey into the unknown, travelling hopefully unconcerned if I arrive or not, and though we all hit the buffers eventually I intend to do it at while still underway! doctor passed by the gallery, looked around, peered over my shoulder, and said, ” Signor Nicholas………….(sigh)………….. you can die happy”. If it were not for the fact that he was my doctor…..